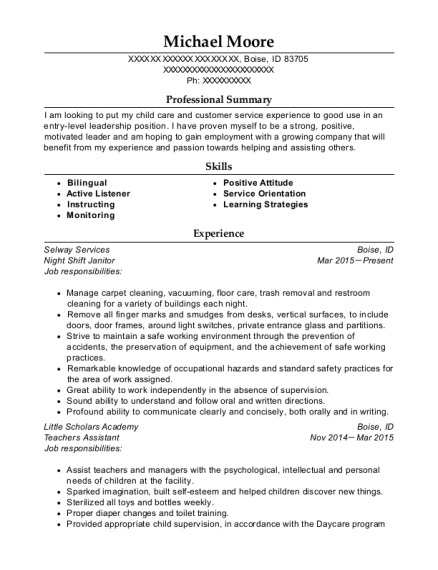 I am looking to put my child care and customer service experience to good use in an entry-level leadership position. I have proven myself to be a strong, positive, motivated leader and am hoping to gain employment with a growing company that will benefit from my experience and passion towards helping and assisting others. Manage carpet cleaning, vacuuming, floor care, trash removal and restroom cleaning for a variety of buildings each night. Remove all finger marks and smudges from desks, vertical surfaces, to include doors, door frames, around light switches, private entrance glass and partitions. Strive to maintain a safe working environment through the prevention of accidents, the preservation of equipment, and the achievement of safe working practices. Remarkable knowledge of occupational hazards and standard safety practices for the area of work assigned. Great ability to work independently in the absence of supervision. Sound ability to understand and follow oral and written directions. Profound ability to communicate clearly and concisely, both orally and in writing. Assist teachers and managers with the psychological, intellectual and personal needs of children at the facility. Sparked imagination, built self-esteem and helped children discover new things. Sterilized all toys and bottles weekly. Proper diaper changes and toilet training. Provided appropriate child supervision, in accordance with the Daycare program guidelines. Assured child safety and appropriate hygiene. Exhibited regular and punctual attendance. Provided age-appropriate lessons, recreation and learning experiences for children in care. Communicated in a thorough and timely manner with parents regarding children's progress, behavior and needs. Assisted with meals and snacks. Helped establish a safe, clean and positive childcare environment. Assessed and met the strengths and needs of every child. Provide assistance with all other tasks needed. Plan and execute units and themes. Read to children, taught them simple painting, drawing, handicrafts, and songs. Managed positive relationships with children and their families. Observed and documented children's interests and progress. Managed the opening and closing procedures of the facility, answered the phone, supervised staff in the afternoon and monitored teacher-to-child ratios for closing. Followed licensing guidelines for supervision that New Horizon Academy required. Lead activities for children for developing high self-esteem and positive self-image. Assisted proper diaper changes and toilet training. Trained new day care teachers. Showed patient, kind, loveliness, care children required. Other responsibilities include assisting in preparing food for children and serving meals and refreshments to children, organizing and storing toys and materials to ensure order in activity areas. Plan and implement learning processes, projects and assignments. Set-up different learning programs that have helped in the bilingual education of students. Speak fluent Spanish to students. Evaluate the learning progress of students and analyze the scope for improvement. Build amazing, trustworthy relationships with students. Assist teachers with personal needs, classroom needs, and required needs for students. Greeted all guests upon arrival and ensured a fast and professional check-in process. Reviewed accounts and charges with guests in the check out procedure. Verified customer's identification and credit for stay. Answered inquiries related to hotel services and amenities. Took messages and ensured their quick delivery. Balance all revenue and settlement accounts. Make corrections and adjustments to books. Run audit reports for office system. Strong ability to effectively deal with internal and external guests, some of whom required high levels of patience, tact and diplomacy to defuse anger. Performed all required front desk necessities while multitasking to get other jobs done such as, clean bathrooms, make/set up all breakfast offered to guests, sweep/mop floors, vacuum, wipe glass entrances, and fold sheets, comforters, towels, pillow cases. Supervised all cameras constantly to maintain a safe, secure environment for all guests to feel comfortable and at home. I am CPR and First Aid Certified, as I also have my Boise child care license. 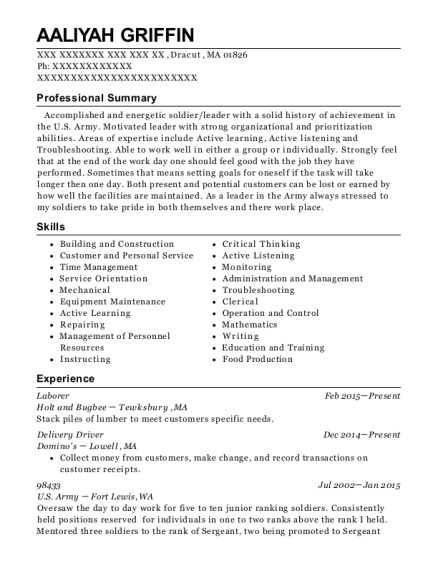 This is a resume for a Night Shift Janitor in Boise, Idaho with experience working for such companies as Selway Services and Little Scholars Academy. 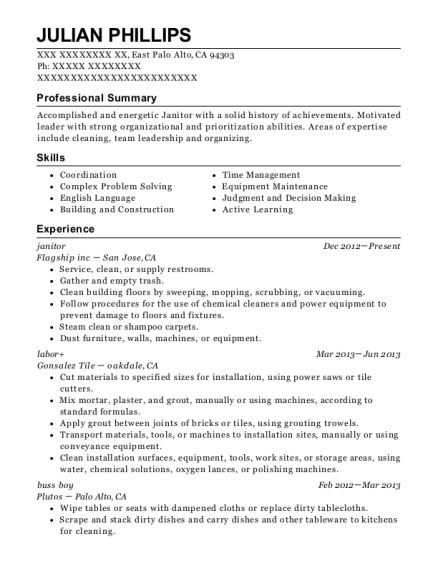 The grade for this resume is 0 and is one of hundreds of Night Shift Janitor resumes available on our site for free. 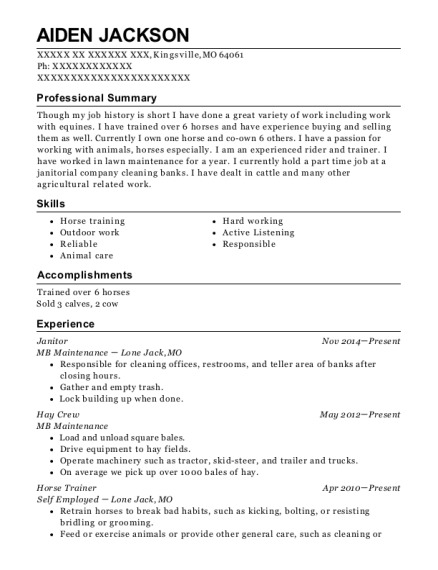 Use these resumes as templates to get help creating the best Night Shift Janitor resume.